Arlington Public Schools (APS) works in close partnership with the Arlington County Police Department (ACPD) throughout the year to help ensure the safety of our students, schools and community. 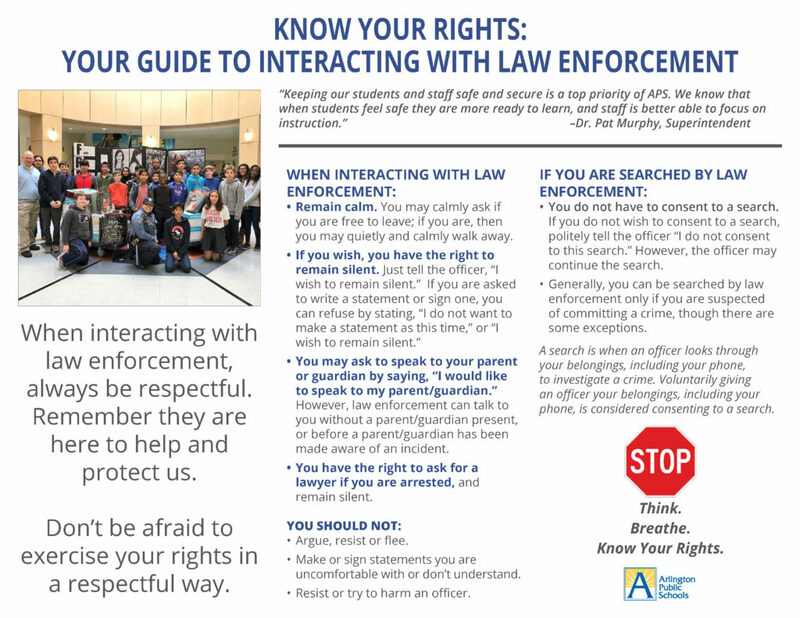 To foster positive relationships between students and law enforcement, each year we provide APS middle and high school students with guidance on interacting with officers and knowing their rights. We will share this information with all middle and high school students and staff beginning next Thursday, February 21. This will be offered as an informational course on Canvas. As educators, we want to make sure our students know their 4th and 5th Amendment rights and have all the resources they need to develop positive relationships with all members of the community and become informed, civic-minded members of society.